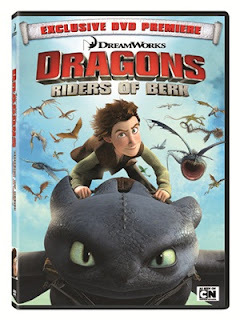 Babblings of a Mommy: Dragons: Riders of Berk, A Dragon-Filled Adventure! Dragons: Riders of Berk, A Dragon-Filled Adventure! How To Train Your Dragon fans rejoice! Hiccup and his BFF Toothless are back with more high-flying and fire-breathing fun with thrilling debut of the animated TV series based on the hit movie. Dragons: Riders of Berk is a 4 episode adventure with new never-before-seen dragons - like the two-headed Hideous Zippleback, the Deadly Nadder, and more! Arianna had so much fun previewing this DVD. She's a big fan of the movie and really enjoyed these exciting episodes as well. Fire-breathing dragons and monsters are not just for boys anymore - girls love these explosive adventures too! Even if it's just 4 episodes, it's a great adaptation of the movie and a fun addition to the HTTYD series - it would make a great stocking stuffer for any dragon lover. 5 Collectible Dragon Training Cards featuring an augmented reality mobile experience. The augmented reality app can be downloaded at dreamworksanimation.com/ar. Use it to bring the Dragon cards to life!